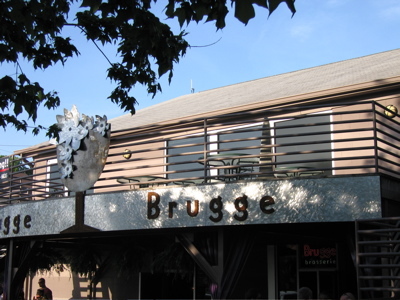 The menu at Brugge is Belgian influenced. Moules frites, crepes, waterzoi, and carbonnade flamande are highlighted. My brother and I chose mitraiallettes, which are their sandwiches. I went with the meatloaf, and my brother ordered the duck confit. Both were served buried in frites (or fries in american) and two sauces for the potatoes. (I went with hot curry and garlic aioli) Both sandwiches were fantastic, and the heaping portion of fries was great, too. I'd even say they were a bargain for about $12 each. I've scored the beer selection low, as there were only three house made beers available. (although there were some great guest taps) The three samples I had were all interesting, twisted versions instead of straight forward styles. I really liked the Veta, sour ale with plums. Nothing wrong with the quality, just not much variety. Service was friendly and knowledgeable, Our seats at the back did seem like an afterthought at times, so I'd recommend sitting at a table instead. Overall, it was a great lunch. I'd definitely revisit. The dementia was really good and also thought there white was good compared to others I have had. The triple which one of there regulars that they bottle was tasty as well. I thought the prices on the beer were reasonable (all tho comparing to Chicago beer places). The food was great, as in one of the other reviews the menu speaks for its self.. Belgian theme... went with a sausage sandwich with frites. With ordering the frites they allow you two dipping sauces and went with the Horseradish and the Sweet chili and the Sweet Chili was great and would highly recommend it. Fr the service, one word great... The bartender talked with me about all styles of beers that they have and do make other styles he likes and gave great descriptions on all the brugge beers. He even recommend I goto the other brewpub up the street and check it out (something that was on my list to do anyways) Other servers while at the bar talk we me as ell mentioning I was from out of town gave em all kinds of local area info and made me feel as if i was a "home bar"
Looks like they have a outside area which would be great in the warmer months and while passing thru I'll definitely check out.. If your near by check it out! 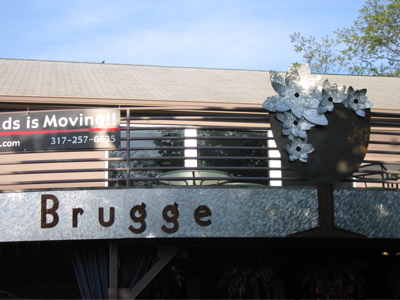 Brugge is leading Indianapolis in what is hopefully a trend of gastropubs. All of their beer and food options are taken straight from Belgium and it's hard to create a bad pairing. Unfortunately, the review is for beer selection and not beer quality. They typically have 3 beers on tap, which is a quite poor selection, but I think every beer of theirs I've had I could drink all night. This past year they purchased the Terre Haute brewing company's facility and have been working on preparing their beer for mass production. A few restaurants in town already have their Black and White on tap. My favorite beer of theirs so far has to be the Diamond Kings of Heaven; which I believe they've only had at beer festivals so far due to a year-long aging process. Still, you can't go wrong with any beer here. The atmosphere is very cool. Large copper tables with holes drilled in them to hold cones of fries. Lots of artwork and a nice warm pub feeling. However; the downside is that the place is tiny. Any night of the week you're going to experience a wait. Lucky, they recently purchased the internet cafe above them and will be expanding to the second floor this year. Everything I've tried on the menu has been great. From crepes to sandwiches to mussels to an assortment of meats and cheese, everything is designed to pair well with Belgian beer. The service is typically slow, but not painfully so. I've rarely had an empty glass of beer. I would say beer prices are average for a brewpub, but cheap for a Belgian beer. 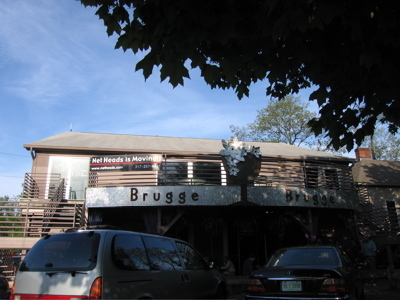 Brugge definitely provides the most unique brewpub experience in town and is a must-visit. 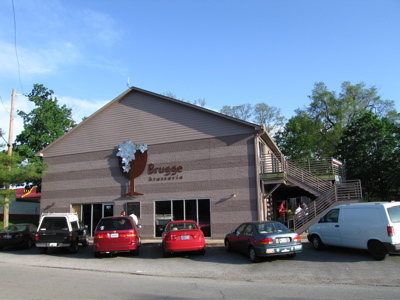 It's amazing for one of the few Belgian-style only breweries to be located here in our town. Beer selection is 3 beers at the time we visited. Black, which was my weapon of choice, Cru dog, which is what don had, and a triple which they only allowed two of... The taps look like they can accomidate up to 6 beers and my thinking on the subject was that they are about to unveil five different beers in 750's were down on beer. the crown jewel on the list tho... Moules frites. the menu speaks for itself. try the food. New signage on the patio side.